Carolina Dunes is a marvelous respite for your North Myrtle Beach vacation, which might otherwise be jam packed with activities, recreation, amusements and attractions. This North Myrtle Beach resort offers gorgeous oceanfront views from the wooden sun deck as well as from the privacy of your own balcony. The best feature of this North Myrtle Beach resort is the Atlantic Ocean and the white sandy beaches that are ready to greet your bare toes. And this feature may be admired from inside your North Myrtle Beach condominium and from outside near the pool deck. Make plans to stay at Carolina Dunes for your next North Myrtle Beach vacation and you will not be disappointed. Carolina Dunes has spacious and beautifully decorated North Myrtle Beach condominium rentals and an indoor swimming pool and hot tub. The beach access is right there at the ground level of this North Myrtle Beach resort so in no time at all your family can be playing in the sand. 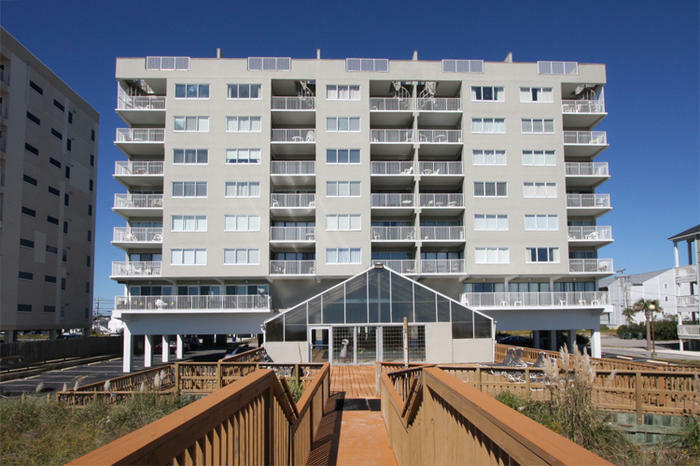 Carolina Dunes is an oceanfront North Myrtle Beach resort that features two- and three-bedroom North Myrtle Beach vacation rentals. These condos in North Myrtle Beach, SC are well suited for families and some of them are nicely accommodating for golf foursomes. The two-bedroom, two-bath North Myrtle Beach condominiums at Carolina Dunes sleep four or six people. They each have a well equipped kitchen with full-size appliances and a washing machine and clothes dryer. The oceanfront balcony in each of these two-bedroom North Myrtle Beach condos is accessed through the living room and the master bedroom. Ocean views are enjoyed from throughout these North Myrtle Beach vacation rentals. There are numerous three-bedroom North Myrtle Beach rentals at Carolina Dunes. All of these three-bedroom condos in North Myrtle Beach, SC have two baths and they sleep either eight or 10 people comfortably. You will find a fully furnished kitchen in these spacious three-bedroom condos that include full-size appliances. The kitchen and dining area overlook the living room, which looks out to the white sandy beaches and the nearby fishing piers. The master bedroom of each of these North Myrtle Beach condominiums boasts a glass door that leads to the oceanfront balcony. Keep the blinds open and you will awaken when the sun peeks over the horizon. Seeing an oceanfront sunrise during your North Myrtle Beach vacation is one of those special moments you will forever treasure. The North Myrtle Beach rentals at Carolina Dunes all have high-speed Internet access and a washing machine and clothes dryer for your convenience. Having these amenities at your fingertips makes for a more convenient North Myrtle Beach vacation. Most of the North Myrtle Beach vacation rentals at Carolina Dunes also come with at least one DVD player so you can bring your favorite movies to the beach with you or rent some while you are here for a quiet movie night during your North Myrtle Beach vacation. Carolina Dunes is a North Myrtle Beach resort that is just a stone’s throw from the Cherry Grove Fishing Pier. Rent a rod and reel or bring your own lunch fishing gear and cast a line into the Atlantic Ocean from high above the water. Watching experienced fishermen reel in their catch of the day is highly entertaining and seeing the North Myrtle Beach coastline from way out over the water is a real treat. For other ways to fish during your North Myrtle Beach vacation just check out the nearby marinas. You can rent your own boat, charter a deep-sea fishing vessel, buy tickets for the head boat or hire a local guide to steer you through the inlet waters for flounder. Fish from shore and don’t forget about the freshwater fishing opportunities available on the Intracoastal Waterway that is just a few blocks away from the Atlantic Ocean. Perhaps you don’t want to go fishing, but eating fish certainly entices you. There are so many seafood restaurants in the North Myrtle Beach, SC area that you cannot possibly try them all. Dine on succulent oysters, steamed shrimp and all-you-can-eat crab legs. Seafood buffets spoil you with all the delicious food that is right there for you to eat. Intimate dinners, beachfront cafes, locals’ favorite sandwich shops and more are within reach when you vacation at Carolina Dunes in the Cherry Grove section of North Myrtle Beach, South Carolina. Myrtle Beach is widely known as a haven for golfers. There are more than 100 Myrtle Beach area golf courses and you are invited to play them all. Make a tee time on of our championship golf courses. Practice your swing at the driving range and relax after 18 holes at the golf course’s clubhouse. The settings are beautiful while the golf courses are meticulously kept. You can golf all year long in Myrtle Beach so bring your clubs or rent some from the pros on site at the various Myrtle Beach golf courses.